In many cases people are emotion driven in their decisions. Therefore products have to interact with consumers through design, logo, and messaging. Woven jacquard selvedges can be the right instrument for it. Electronic Jacquard machines together with our selvedge thread let-off’s CS2 are particularly suitable for weaving-in custom labeling on selvedges and fabrics in a wide variety of applications. The CS2 guarantees a constant thread tension during the whole weaving process. Weaving a brand name enhances the value of fabric and helps preventing counterfeiting. The let-off system is equipped with a tensioning arm that functions as a measuring element for the warp tension and compensation of tension peaks during warp shed forming. After the adjustment of warp tension the tensioning arm keeps its position during weaving. It is a balance between yarn tension and spring load. By controlling the tensioning arm during weaving, the yarn tension is maintained at a constant level. Changing the warp bobbin diameter is the main reason for warp tension variation and can be prevented by using the let-off CS2. The unit can also be used for weaving fancy yarn or placing marker threads. The unit works with all common flange bobbins for selvedge yarns. — WARP BOBBINS: For natural and man-made fibers. — SEMI-AUTOMATIC WARPING MACHINE: For natural and man-made selvedge thread yarns, as well as for tape yarn warp bobbins. 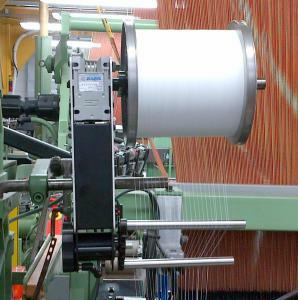 The warping machine is equipped with the latest control and operating technology.